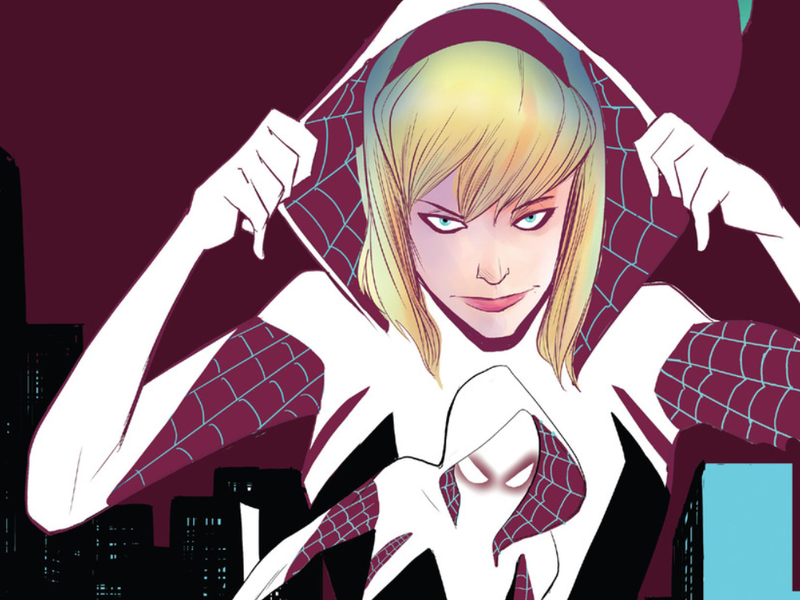 Spider-Gwen is a weird title for the newest heroine to swing through the Marvel Universe. Technically, she's a Spider-Woman. But the 'Gwen' part of her moniker highlights the most potentially exciting aspect of her: she's an alternate version of Gwen Stacy, a character most famous for how she died. Forty-two years ago, Spider-Man lost a girlfriend in a brutal battle with the Green Goblin that ended in a cruel, twist ending. The final pages of The Amazing Spider-Man #121—in which the wall-crawler snags Gwen with webbing after his archenemy knocks her off the George Washington Bridge—went on become an iconic part of comic-book history. It was a collective loss of innocence for an era of fandom, which dared to present a story where superheroes can't always save innocents. Comic book characters don't usually stay dead. Supergirl dies. She gets better. Captain America dies. He bounces back. But same characters, even when they show up in new continuities, seem to exist to be killed. For a long time, that's been Gwen Stacy's plight. Spider-Man's first true love is so associated with her untimely end that the inevitable questions cropped up about her when it was announced that she'd be Peter Parker's love interest in the most recent Spidey film reboot. "Is she gonna die?" "You can't put her in the movies and not have her die, right?" The filmmakers responded by coyly teasing that they'd stay true to the comics. Granted, the handling of her on-screen death was one of the best things in The Amazing Spider-Man 2. Emma Stone's portrayal of Gwen was a smart, vital part of the film, but there she was dead all over again. Recurring death plots are rough enough for a character, but Gwen Stacy's been written into other miseries, too. A decade ago, a comics story called Sins Past introduced the plot point that Gwen had slept with Norman Osborn (and borne children for!) before he killed her. This retcon was hated by many longtime Spider-Man fans and made Gwen even more of a plot device than she'd ever been before. Sins Past never seems to feel like it comes from what she might have desired for her own happiness. It's a series of events designed to make Peter Parker feel and react the way the plot required. And let's not even get into the time that she was brought back as a clone. While the Ultimate Universe version of the character never suffered a tragic death, she's still been written in a secondary role. [Note: It's been pointed out that this version of the character did die at the hands of supervillain Carnage, only to come back as a clone in this reality as well. I totally forgot. Apologies for the error.] It's way past time she got to be alive and written about in an altogether different way. And a new, alternate-reality version of Gwen Stacy is letting Marvel do just that. The run-up leading to this week's Spider-Gwen #1 has been almost entirely unexpected. She debuted just four months ago as part of the Spider-Verse crossover event and seemed to be an immediate hit. After her initial appearance in Marvel's high-profile event, Spider-Gwen got her first real spotlight in Edge of Spider-Verse #2, which was a surprise critical and commercial success (it's had four printings). The enthusiastic reaction to Spider-Gwen is due in part to a great character design. Her costume—which brilliantly fuses negative space ideas, high-contrast coloring and could-actually-exist practicality— is one of the best riffs on the Spider-Man motif in decades. But the other source of excitement could come from the chance to re-visit a character most famous for being a plot device and a victim. In her appearances so far, this alternate version of Gwen Stacy has been both divergent and familiar from the one who died in the mainline Marvel Universe. She still has a cop for a dad, one whose job entails hunting for New York's web-slinging vigilante. But she harbors much of Peter Parker's usual travails, too: being broke, enduring media smears and co-existing with a fickle, often unappreciative public. She cracks wise when busting bad guys, too. With this first issue of her new series—created by Jason Latour and Robbi Rodriguez—Spider-Gwen feels like it's basically kicking off an extended What If? (in a good way). The comic takes place in an alternate universe. And like Marvel's old-school speculative series, readers will show up to see how familiar elements of characters' lives get re-invented. There's a whole 40-year-wide palette of continuity to mix and match. So, it's intriguing when J. Jonah Jameson runs the entire city instead of the Daily Bugle newspaper, as in recent Spidey plotlines. In another example, a character best known for gunning down criminals without remorse is part of the police force here. This first issue features a familiar central villain in the form of the Vulture but Gwen's methods for calling out to a showdown—graffiti insults only he can see while flying—feel fresh and unique. In a weird way, Spider-Gwen feels inter-related with Silk, the other new Spider-heroine recently introduced to Peter Parker's corner of the Marvel Universe. Both of them are riffs on the Peter Parker formula, in that the main characters are perpetually put-upon everypeople. None of them are unbelievably rich or powerful enough to destroy planets. However, Spider-Gwen looks like it's going to engage more with the social-outcast themes from early Spider-Man stories. For example, Gwen has to deal with decisions about whether she can still be in the Mary Janes, the garage-band-made-good led by frenemy Mary Jane Watson. Yes, the same Mary Jane that's Peter's principle love interest in the mainline universe. There's not been any romantic tension yet in any of her spotlights but that feels okay considering the older version of Gwen Stacy was pretty much arm candy for much of her existence. But what of this Spider-Gwen's version of Peter Parker? Peter Parker dies the most perfunctory, plot-driven death in Edge of Spider-Verse #2. His demise wasn't preceded by any sort of grand romance either, just lots of story-convenient pining-away. He's been rendered in a ghost, a source of guilt and motivation for Gwen to grapple with. It's a role reversal that feels enriching to what the creators are trying to do, which is to, at long last, give Gwen Stacy a reason to live.